For a limited time, Fry’s is offering some high value coupons on popular brands. 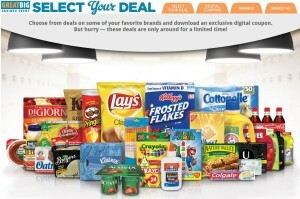 It’s The Great Big Savings Event Select Your Deal coupons. You will be given an option of 3 high value coupons. You select the one that appeals to you, and add it to your card. I was able to select $1.50 Off Best Foods Mayonnaise. Check back daily to see if new offers are available.